What is a digital workspace and what does it take to create one? If we break it down, the workspace is a portal for end users into all of their apps and online services that they canseamlessly and securely access across devices and locations. But what makes the workspace of today different from the desktop or mobile device of the past? And how can you move forward with delivering a digital workspace? 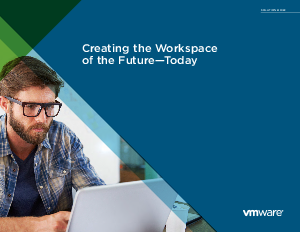 Download this solution brief to learn how VMware® Workspace™ ONE™is designed to deliver a digital workspace that integrates device management, application delivery, and identity management into a single platform on your terms, via your data center, in the cloud, or through a combination of the two. This workspace can be accessed by your end users across devices and locations and be centrally secured and supported to streamline management and improve the quality of services you deliver across the entire organization.